One of the ways in which a photographic studio could "add value" to its products was to offer an enlargement and framing service, and all but the smallest or most itinerant of operations tended to do this. The most basic type of framing in the early days, for daguerreotypes and ambrotypes, was an embossed leather- or papier mache-covered and silk- or velvet-lined rectangular wooden or thermoplastic case, which served the dual purpose of protecting the delicate images, examples of which are relatively common. If the portrait was wanted for display purposes, however, an alternative option was to have it mounted behind glass with a mat and frame, in much the same way as painted portraits were done. I went north in October, and visited an old lady of 89 who is the great-grand-daughter of Christopher Richardson, my great-grandfather Thomas's brother. She very kindly gave me two photographs of two of Thomas and Christophers' sisters. The eldest girl is Mary Ann Esther Richardson born 1844, and her sister is Eliza Richardson 1847/1852. They were born in Neasham, Yorkshire, near to Darlington, their father was a shoemaker. I know very little about early photography - except that I seem to recall that daguerrotypes were very expensive, so for the rich! I have taken the back off one of them and found:- Looking at the photos from the front, there is a glass covering, behind that the white and gilded mount. Behind that a coloured glass plate (with blue poorly fixed powdery substance, which came away on a cotton bud). Behind that a loose piece of almost black velvet, and laid on this loose piece of velvet at the bottom edge, about 1\3" thick, a roll of velvet - this holds the bottom of the glass negative just off the loose piece of velvet. Behind that a piece of card. The whole inner part pinned to the frame with ½" nails with extremely small heads. The only other method of photography in about 1848 I have heard vaguely of is the process known as albumin negatives. Would there have been a photographic studio in Darlington at such an early date? Or would there have been travelling photographers? These are the earliest photographs I have and I would be thrilled to learn more about them. After I had cautioned Brenda about the danger of dismantling ambrotypes and daguerreotypes, she assured me "that I only took the cotton bud to the extreme edge of the glass plate, to see if the 'blue' was fixed. The whole process of taking the picture apart frightened me hugely! They are, in fact, ambrotypes, which succeeded daguerreotypes and were considerably cheaper. The wet plate collodion positive process was invented in 1851 by Frederick Scott Archer, and became very popular for portraiture in a short space of time, so that by the mid-1850s, it had all but supplanted the daguerreotype. As it required little skill and a much lower cost to set up and produce ambrotypes, this continued to be the method of choice for almost a decade, until the even cheaper tintypes, paper prints and cardboard-backed carte de visites took over in the early 1860s. The photograph was printed as a negative on the inside of the glass, and the black velvet backing then had the effect of turning this into a "positive" image. The coloured plate was used to impart colours to the image, as trying to colour the image itself would have destroyed the collodion. The whole set-up was then usually encased in a box similar to those previously used for daguerreotypes, although framed examples with white and gilt matts such as these are fairly common. A further development of the collodion positive process resulted in the ferro-type, commonly referred to as a tin-type. In this method the collodion was coated onto a thin sheet of black-enamelled, or "japanned," iron, and often covered with clear varnish, thus rendering them more durable than the ambrotypes that they replaced. Being more robust meant that they did not need cases, and could be sold "as is," in cardboard and/or paper frames, or presented in specially designed gem tin-type albums. Being ambrotypes, Brenda's two portraits were indeed affordable to many everyday folk of the period, although would still, I suspect, have been quite a significant expense to the family of a shoemaker. The younger child appears to be about two years old, the older one perhaps four. I estimate that they were taken in the early to mid-1850s, say between 1853 and 1856, and the mounts and frames appear to be contemporary with the photographic images. The portraits both have the same toy in the left hand foreground, a wheeled horse with a missing head. This suggests to me that they were taken on the same occasion, and that one should therefore be looking for two children, aged about two years apart, who were born c.1849-1852 and c.1851-1854, respectively. These dates don't really quite fit with the birth dates of Brenda's Mary Ann Esther and Eliza Richardson. I found them on the 1851 Census, living with their parents, Robert & Ann Richardson in the village of Neasham, County Durham, and numerous siblings, although by the time of the 1861 Census, Mary Ann was working as a servant and Eliza was nowhere to be found. I presume that she had died in 1852. I think it very unlikely, therefore, that the two children are Mary Ann and Eliza as identified by Brenda's relative, and would suggest looking for other members of the family who they might have been. There were almost certainly photographic studios in Darlington by the mid- to late 1850s, although they may have been operated on a temporary basis by photographers visiting from larger towns. Alternatively, family members may have travelled to a larger town and had their portrait taken there. There is ... a problem. With one, not very likely, exception, there are absolutely no other children who could fit that time frame. If the photograph was taken mid-1851, there is one other child born who could fit. This was William born 22 May 1849, the younger brother of the two girls, so Eliza would have been 5, and William 2 years and some months. Can the younger of the children be seen as a boy? It doesn't seem likely, why is 'he' wearing a frock. There would have been 'hand-me-downs' from the three elder sons. Young boys and were commonly dressed in very similar, if not identical, clothes in this era, in particular dresses, and boys were often only "breeched," i.e. fitted with trousers, when they were 6 to 10 years old. One can sometimes tell from the position of the parting in the hair (central for girls, or side for boys) whether a child was a boy or girl, but this is by no means a fool-proof method. I'd prefer to leave further interpretation to Brenda, as so much of the investigative process depends on a detailed knowledge of the particular family. Out of interest, a close up image of the top left hand corner of one of the frames shows that it is made from wood with plaster embellishment. 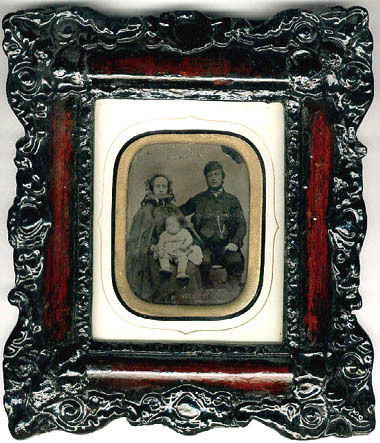 Roger Vaughan has an ambrotype of a couple and a small child with a very similar mat and frame, here. George Henry Swift was one of those for whom photography was merely one of many talents. Looking at it from a slightly different perspective, his career as a photographer probably didn't last very long. Although he was born in 1846 in the village Gamesley, near Glossop in Derbyshire, Swift grew up in Lockwood, near Huddersfield in Yorkshire, where his father and older brothers worked as stone masons. At the age of fifteen, by which time his father had died, George was an accountant's clerk. In 1868, however, he married Maria Penelope Whiteley. They moved to Chapel-en-le-Frith in 1870 or 1871 and George became landlord of the Shoulder of Mutton Inn in Townend. Probably commencing some time in the mid-1870s, George Swift tried his hand at photography, and by the time of the 1881 Census was described as a photographist, although Kelly's trade directory for that year indicates that he was also secretary to the agricultural society and a rates collector. His wife died in late 1880, a couple of years after the birth of their fifth child. He remarried at Stockport in 1886, to Sarah Ann Harrison, and appears to have moved to Belper shortly after, as Kelly's trade directory for 1887 shows him as a Conservative registration agent, living in Campbell Street. It is interesting to note that photographer Jacob Schmidt, who had only recently moved to Belper from Bristol, was living next door in 1891. Swift, however, appears not to have returned to the photographic business, describing himself as a political agent in 1891 and a musical instrument dealer in 1901. This carte de visite, sent to me by Ann Taylor, was taken by G.H. Swift, probably some time in the late 1870s. It shows, a church, churchyard, low wall and street. Unfortunately the location is not specified. It would be tempting to assume that it is the parish church of Chapel-en-le-Frith, in the Peak District of Derbyshire, dedicated to St. Thomas-a-Becket, "a stone edifice in the later English style." [Source: The National Gazetteer (1868), courtesy of Rosemary Lockie's GENUKI Derbyshire web site] However, modern images of that church (example) show some siginificant differences and I have my doubts. In my view, a much more likely candidate is the parish church of St. Edmund in Castleton, situated a few miles to the east of Chapel-en-le-Frith, a photograph of which I first found in my copy of "The Old Parish Churches of Derbyshire" by Mike Salter (Folly Publications, 1998, ISBN 1 871731 33 X). A much better recent photograph by John Stanbridge, shown above, is included as part of his Flickr photostream. The reverse of the card mount shows a hand stamp with the photographer's details, "G.H. Swift, Photographer, Chapel-en-le-Frith." This carte de visite portrait of an unidentified elderly woman from my own collection is probably from a similar era, i.e. the late 1870s. It has an identical back stamp, suggesting that Swift may not have been in business for long enough to have had his own card mounts printed. Some time ago, I found this image of a postcard on the net, but I've unfortunately mislaid all record of where it came from. I believe that it's well out of copyright, so there shouldn't be any problem with reproducing it from that point of view. However, if any reader knows anything about it, please get in touch by email - I'll be very happy to acknowledge and attribute the source. The photograph is of a group of about forty, mostly young men in a variety of military uniforms, arranged in the middle of a tented camp, with a backdrop of large trees. The word, "CLUMBER," and number, "606.," were obviously inked in pen on the negative, as they appear in white at the lower right and lower left of the front of the postcard, respectively. The photograph has a standard divided back postcard format, with the photographer's name printed on the reverse, "Photo by H.P. Hansen, Ashbourne." H.P. Hansen operated a studio in Ashbourne, Derbyshire from the late 1890s until at least 1922. He travelled fairly widely to produce general views of popular Derbyshire attractions, as well for commissions such as group portraits tailored for particular clients. This appears to be an example of the latter. I'm not particularly strong on uniforms, but I am aware that the regiment commonly known as the Sherwood Foresters drew heavily for its ranks from the young men of Derbyshire and Nottinghamshire. A simple Google search using the terms "Clumber" and "Sherwood Foresters" hit the jackpot! An enlarged view of this more formal group portrait shows a very similar range of uniforms and tents. There are plenty of trees around, which is understandable if the location is indeed Clumber. According to the web site of the National Trust, which owns it, Clumber Park is near Worksop in Nottinghamshire and comprises "peaceful woodlands, open heath and rolling farmland, with a superb serpentine lake at its heart and the longest avenue of lime trees in Europe." It was a country park partly designed by Capability Brown, and owned by the Dukes of Newcastle. This image also has a number, "637," suggesting that was also by Hansen, from the same sequence, and possibly taken on the same occasion. This cabinet card of a young child and a dog is an intriguing one, not only because of the anonymity of the subject. It appears to have been taken in an unknown rural location - on a fairly smooth, but stony track with a rough stone wall and a hillside in the background - but the studio location is in Bramble Street, Derby. I have never come across any reference to the The Portland Photo Co. previously - that's why you'll currently find no entry for it in my Index to Derbyshire Photographers & Studios. From the style of the card mount and the clothing worn by the child, I would venture a guess that it was taken in the late 1890s or early 1900s, say between 1895 and 1905. The only photographer that I know of who worked in Bramble Street, Derby during this period was Frank Birch, who was probably there from late 1894 until c.1898, after which he removed to premises located at Nag's Head Yard, 64 St Peter's Street. It was during this period that the cabinet card presented in a previous article about Frank Birch was produced. Then, in 1903, Birch became manager of the Derby Stereoscopic Company, located at 36 Victoria Street. I wonder if Frank Birch also traded for a short while as The Portland Photo Company? There was, and still is, a Portland Street in Derby, but this is situated some distance away in the suburb of Litchurch. I have just been doing some research into a Boston USA family called Baker Hinckley. Is this just a bizarre coincidence, because the link given on family history site is you again! I am never successful with good [daguerreotype] images on Ebay but I was determined and successful this time ... the Daguerreotype was of a named woman, "Esther Hinckley Baker out of Providence"! I had no idea at this point that this would lead me back to you! Now Providence is 40 miles from Boston and the daguerreotypist is named on the plate as Hale. Although there were several Hale daguerreotypists there was one established in Milk Street, Boston about 200 yards from the [more famous] studio of Southworth and Hawes in Tremont Row ... The first thing that drew me to this image was that is is so typical of the fine portraiture of Southworth & Hawes. Nino subsequently sent me a scanned image of what I agree is a lovely portrait of a attractive young lady. The daguerreotype measures 53 x 66 mm, which is commonly referred to as a ninth-plate size. It appears to have lost its case, but still has the matt and pinchbeck surround. The most exciting discovery for me was the identity of the subject. A few years ago, I purchased this small (82 x 91 mm) green faux-leather album because I was looking for a relatively inexpensive example of a gem tintype album, and this one appeared to have several of the subjects identified which, from a genealogical point of view, endeared me to it immediately. The album contains 35 photographs, 27 of which have been annotated. In addition, the front inside cover of the album has what appears to be the original owner's name, "Henry H. Hinckley," written diagonally across the page. I used census and other records to identify the owner of the album and build up a detailed picture of his family, eventually succeeding in identifying portraits of fourteen different members of the extended family. These included a daughter and a grandson of Henry H. Hickley's paternal aunt Esther May Hinckley (1812-1850), who married Captain Ezra Howes Baker (1811-1876) in 1832. It appears that she is the subject of Nino's daguerreotype! Esther was born on 7 August 1812 at Nantucket, Massachusetts, the fourth of ten children of Lot Hinckley (1782-1852) and Rebecca Cobb. Her family moved to Barnstable in the mid-1820s and that is where she was married, but she then settled with her husband, a sailor and merchant, in South Dennis or Yarmouth Port, Barnstable County. A few years later, in 1838, they moved to Boston where Ezra was in partnership with various individuals, owning ships and engaging in domestic and foreign trade. Esther is reported to have died on 25 July 1850, a few months after the birth of her fourth child. However, the federal census of that year, enumerated on 24th August, shows the family living in Boston Ward 12, including Ezra, Esta [sic] and all four surviving children, so her actual date of death is not clear. An 1890 history of Barnstable County, reproduced online by David Kew, contains a detailed biography of Ezra Howes Baker, including a fine portrait of him, and which repeats Esther's July 1850 death date. By way of comparison, the selection of Southworth & Hawes daguerreotype images made available on Flickr by George Eastman House includes a similar style portrait of an unidentified young woman with an almost identical hairstyle, shown above, tentatively dated c.1850. In January this year, I was contacted by Sam Hinckley, a great-grandson of Henry Hersey Hinckley, owner of the gem tintype album. He sent me some more photographs of the Hinckley family which I hope to feature in a future Photo-Sleuth article, and I'm sure will be excited to hear of the discovery of this early photograph of another family member. Many thanks to Nino for bringing this remarkable coincidence to my attention, and for supplying the engaging image of his recent purchase. Ezra Howes Baker, in Wing Family of America, Inc.
John Bradley recently sent me this intriguing image of a mounted albumen print (202 x 134 mm) of two carts in front of a large stone and brick building with a tiled roof which had previously been framed. The reason for his - and my - particular interest is that on the back is the nice clear stamp of Chesterfield photographer Alfred Seaman. In view of the fact that the name states only Alfred Seaman, not his sons, and the Brewery Street studio address only is listed, this suggests that it was taken early in his career, perhaps between 1879 and 1882. A carte de visite with identical studio address from my profile portfolio of Seaman photographs is shown below. Although John Bradley's mounted albumen print does not have a caption, he was able to deduce the approximate location as being near to Fakenham in Norfolk from a detailed examination of the signs in the photograph. An enlargement of the signpost visible on the right hand side reveals the destinations, Sculthorpe, Shereford and Raynham. The most suitable location for a signpost with this particular configuration would be at the junction of current A1065 (Raynham Road) and the Shereford Road, in the small village of Hempton, as shown in the GoogleMaps satellite image below. It appears that the building shown in the old print may even still exist - the long building, or series of connected buildings, oriented roughly east-west and situated directly to the east of the crossroads in the image above - although there may have been some modifications, particularly in the roof line. The sign which hangs from a post situated prominently at the corner of the building clearly states, "The Buck Inn," unfortunately with little in the way of decoration or further embellishment. In the doorway stands a middle-aged or elderly woman wearing a white apron, apparently with her left hand on the door latch, and a large bonnet in her right hand. Directly in front of her stands a boy, perhaps in his early teens, dressed in a suit and bowler hat, holding in his left hand the bridle of a pony which is harnessed to an empty two-wheeled cart. To the left of the building is another two-wheeled cart, piled high with barrels. Initially, I thought that it was parked at the side of the building, but a closer look shows the legs of a horse, and perhaps a boy leading the horse, and I now believe that the cart is heading north along the main road. A wall is visible in the background, and there are some more buildings in the distance. Examination of census records, trade directories and data provided by the Norfolk Public Houses database shows that George Gates was proprietor of the Buck Inn in the village of Hempton from 1865 until 1881. He was born in Hempton in 1818 and was a bootmaker before taking over the Buck Inn from Robert Brundle in the early to mid-1860s. He died at the age of 64 in 1882, and his widow Mary Ann Gates continued to run the inn until she, too, died in 1897. It seems likely that it is she who stands in the doorway in John's photo. Their son Robert Gates (1859-) took it over before 1900 and was the landlord for a few years, but appears to have sold the business to a William Howe by November 1908. It is interesting to note that there were no less than three inns in Hempton for a population of just 566 inhabitants in 1881 - the other two were The King's Head and The Bell - but I suppose they were coaching inns and relied mostly on passing trade. Jonathan Neville's web page devoted to the Hempton towermill has a number photographs of the mill, several of which include the building of the Buck Inn, over a period from 1905 to c.1930. The photograph reproduced above is dated 1910, and shows the Buck Inn building at the right, largely unchanged from the days of John Bradley's albumen print thirty odd years earlier. John Bradley posed the question as to why Alfred Seaman, a studio photographer based in Chesterfield, Derbyshire, should be taking photographs, even if they were commissions, over a hundred miles away in rural Norfolk. Both of us are well aware of Seaman's Norfolk connections. He was born in the village of East Lexham, married a young woman from Walsingham, and first settled in the town of Fakenham, before moving several times and ending up in Derbyshire by the mid-1870s. Family members have provided photographic evidence that Seaman did return to Norfolk in the 1890s to visit family members and take their portraits, so it is quite conceivable that he was making such visits in the early 1880s too. Whether he was related to George Gates or his wife Mary Ann (maiden surname Loads) in some way is not known. I previously posted an advert by Wirksworth photographer James Watterson (1878-1953). This carte de visite from Graham Robinson is the only example that I have seen of Watterson's work, although he and his father George were in business as photographers from the early 1890s until at least the early 1920s. Stuart Flint claims (Source: Hackett the author 1843-1900 on John Palmer's Wirksworth web site) a much earlier start to the photographic business of the 1870s at Baileycroft Pingle, but I haven't yet seen any evidence for this. James Watterson emigrated to Canada and died in Vancouver, British Columbia in 1953. The portrait is of Elizabeth Potter (1903-1993), probably taken around 1906, when she was three years old. She was a daughter of Edward Robinson Potter and Annie Maria Street, and married Ernest Butlin in 1925. The photograph and card mount are typical of the early 1900s. While the use of larger cabinet cards tended to dominate medium price range of the market, and postcards and larger format mounted prints were becoming more popular for the lower and higher priced ends of the market, respectively, cartes de visite were still commonly used until c.1908-1910. The CDV mounts generally had square corners and were blank on the reverse, but the borders of the mount were often embossed with varying patterns and designs, and were regularly made with coloured card (although not in this particular case). This rather nice cabinet portrait from John Bradley, possibly taken in the early 1880s, shows an single-horse, open carriage with top hatted driver, parked on the street in front of a large building. I have discovered that this type of carriage is called a landau, invented in the German Rhenish Palatinate in the 18th Century, but first produced in England by a coachmaker named Luke Hopkinson in the 1830s. It is an open style of carriage, designed with facing seats so that the two rows of occupants can sit facing each other. However, there are no clues as to the location, the identity of the driver, or the owner of the carriage. If any readers are able to shed further light on the location, please get in touch by email or post a comment. The reverse of the card mount reveals it to have been taken by "Professor" Frank Simpson. Simpson - although he style himself "Professor," it seems unlikely this was a genuine title - assisted by his wife Elizabeth Ann, claimed to operate from numerous different locations, including Barking Road (London), Humberstone Gate (Leicester), Swan Bank (Burslem, Staffordshire), Spring Gardens (Buxton, Derbyshire) and St. John Street (Ashbourne, Derbyshire). However, it is unclear how many of these were actual branch studios, rather than merely locations at which he periodically parked his caravan and took advantage of passing trade until moved on by the local law enforcers. "a photographer, and having a travelling van situated in the parish of Clifton [was] summoned by Mr. Superintendent Corbishley for exercising his ordinary calling as a photographer on the Lord's-day, on the 17th inst. - Mr. Corbishley said that on Sunday, the 17th. inst., about 3.30 p.m., in company with Inspector Lytle he visited Simpson's van, and saw 16 persons in the van; he saw the defendant take two likenesses while he stayed; he told him he should summon him; there were about 30 persons standing on the highway near to the van. - Mr Wright said he saw no necessity for the defendant following this business on the Lord's-day, and he would fine him the full penalty. - Fined 5s. and costs." Four years later, in April 1871, Simpson was at Swan Square, Burslem, presumably in his caravan. In March 1874, an employee of Simpson's was convicted of embezzlement from Simpson at Ashbourne, and he is listed at St. John Street, Ashbourne in the 1881 edition of Kelly's trade directory, probably compiled late the previous year. By census night on 3 April 1881 his caravan was parked near the White Lion Inn at Spring Gardens, Buxton, presumably taking advantage of the seasonal visitors to the mineral baths. The 1887 edition of Kelly's shows him listed in both locations - Ashbourne & Buxton - but from 1891 onwards he seems to have concentrated his activities around the latter. Directory entries and census records show him variously at 53a or 53½ Spring Gardens until 1899, and possibly at 53 Market st, Buxton, although I have been unable to locate him in the 1901 Census at all. It is conceivable that he was the Frank Simpson, aged 71, whose death was registered in the Chapel en le Frith Registration District (which includes Buxton) in the first quarter of 1896, and whose will was proved at Buxton in the same year. In this case the 1899 entry may have been for his wife, continuing to operate under her late husband's name. I am still wondering what the "V..." on the line above "RA...." is on the old landau photo. I wonder if it was called the "Valley Railway Hotel" to differentiate it from perhaps another railway hotel? These photographs by David Seale and Arjen Bax show the Railway Hotel in more recent times, withe railway viaduct forming a backdrop. Brenda Croome recently sent me a series of images of her great-grandmother Caroline Richardson née Young (1852-1928) of Derby showing a nice sequence of cartes de visite and other format portraits from her late teens to her mid-forties. The first of these portraits was taken by John Roberts at his Osmaston Street studio, and includes Caroline's half-brother Richard and half-sister Rosamund Smith. The elaborately painted backdrop depicts a country scene. Although Caroline was born in Derby in 1852, her mother Sarah Ann Young married William Smith in 1854 and moved to Aston-on-Trent, where her half-siblings Richard and Rosamund were born in 1855 and 1866. The youngest child Rosamund looks to be about five years old and I suspect, therefore, that they visited Roberts' studio around 1871. The census of April that year shows Richard, aged 16, and Rosamond [sic], aged 5, living with their parents at Derby Road, Aston-on-Trent, while Caroline Young was living at Walton Hall, Walton-on-Trent, where she was employed as a nursery maid by Richard Ratcliff (1830-1898), of the Ratcliff brewing family (Bass, Ratcliff & Gretton). In a coincidental connection with my own family, Richard Ratcliff's younger brother Robert Ratcliff (1837-1912) had married my ggg-grandfather's half-cousin Emily Payne (1837-1916) in 1866 and later settled at Newton Park in nearby Newton Solney. The next two cartes de visite were taken at the studio of W.W. Winter in Midland Road, Derby. The card mounts of both are of a style (Type VI) which I have estimated previously as having been used c. 1874 to 1877. Although clearly not taken on the same occasion, as Caroline is dressed in different clothes, the two were probably taken at around the same time. The first shows her in a dress with a large bustle, and her hair braided and piled up on the top of her head. Her clothing and hair styles are typical of the early to mid-1870s. In the second Caroline is dressed in "walking out" clothes, including a smart jacket and feathered hat, and poses with her left elbow leaning on a "rustic" wooden studio fence. She is with a young man who Brenda identifies as her husband-to-be, Thomas Richardson (1851-1898). Both are carrying umbrellas or parasols. The card mount is dated on the reverse, "March 1874," and was therefore taken some nineteen months or so before Caroline and Thomas were married at All Saints, Aston-on-Trent, Derbyshire on 14 October 1875. After their marriage, Caroline and her husband lived first in Yorkshire, and then by late 1880 had settled in the lodge at Simonside Hall, Harton near South Shields, Durham, where Thomas was employed as a gardener, presumably by the owner and resident of the hall George May, a mining engineer who was chief agent of the Harton Coal Co. Ltd., and manager of the St Hilda Colliery. Richard and Caroline had three children: Charles Robert (born 1878), May Susan (born 1880) and Janet Amy Ann (born 1882/83). Brenda has two portraits, shown above and below, which appear to have been taken on the same occasion in the early 1880s at a branch studio of the firm A. & G. Taylor, located at 4 St. Nicholas Buildings, Newcastle on Tyne. Although the portrait has been folded and torn, the bulk of the photographic image is fortunately still intact. Her hairstyle, the lace collar and the highly embroidered and embellished bodice of Caroline's dress are suggestive to me of the mid-1880s. The studio was located opposite the Cathedral Church of St Nicholas and adjoining the post office in the centre of Newcastle, and although not exactly handy to Harton, was probably a convenient place for them to visit on special occasions. According to Osman (1996), although the Newcastle branch operated from 1878 until at least 1900, this particular design of card mount - referred to as the "Crown & Plume of Feathers-type" and shown below - was mostly used by branches between 1882 and 1886. Brenda's cousin also has two very nice miniature portraits, hand coloured, framed and glazed, which were obviously reproduced using the negatives from the A. & G. Taylor portraits. Thomas Richardson died in 1898. Three years later, at the time of the 1901 Census, Caroline was living at Station Bank, South Shields, and described herself as a "caretaker." Her two daughters were still living at home, while son Charles Robert, recently married, was living with his parents-in-law nearby. The last portrait in the series is a large format mounted print of Caroline Richardson, probably taken between 1904 and 1910, when she was in her mid-fifties, although she doesn't look it. She is warmly dressed in a long dress, with a fur around her neck, fur muff and a wide feathered hat. She has with her a dog on a leash which, although fairly well behaved, has not stayed still for quite long enough to avoid being slightly blurred in the photo. Robert Hamilton Carling (1865-1941) was a portrait photographer and miniature painter, originally from Wales, who operated a studio, sometimes known as the Grand Studio, at 38 King Street, South Shields from c.1894 to around 1930. Many thanks to Brenda for the images and information featured in this article. Osman, Colin (1996) The Studios of A. & G. Taylor, The Largest Photographers in the World, Supplement No. 111 to The PhotoHistorian, March 1996, ISSN 0957-0209. In a series of three previous articles (Parts 1, 2 & 3) I described how researching life of my Miller ancestors and visits to the village where they lived had uncovered a great deal of interesting material, and resulted in the acquisition of a new family heirloom. I've now come across quite a bit more material which relates in particular to the head of this family from Weston Underwood in Derbyshire, and have received some more relevant photographs, all of which help to illustrate the story very nicely. I have known the basic outline of the life of my ggg-grandfather James Miller (1815-1893), a drainage contractor and brickmaker from Weston-Underwood, for some time. This background information was supplied by the widow of his great-grandson, Gwen Miller, and researched by myself through parish and census records. He was born in about January 1815 in the village of East Leake, Nottinghamshire, son of Mary Miller, and after marrying Mary Cuckson (1815-1878) in Gamston (Notts) lived briefly at Markham Moor, East Markham (Notts), where he worked as an agricultural labourer. In the late 1840s, he became a land drainer, working at various places in eastern Cheshire before settling in Weston Underwood around 1858-1859. Soon after arriving in the village, he established a brickyard, employing a number of men and boys, including several of his sons. James and Mary Miller had four daughters and three sons. Mary died in 1878, and James remarried Elizabeth Gardner née Garton at Derby the following year. In the 1891 census he described himself as a farmer and surveyor, and he died in 1893. Some time ago, my Dad's cousin Mary Hirst sent me a transcript of a lengthy newspaper cutting which I filed away then forgot about. However, I have just rediscovered it, as well as a rather poor copy (it appears to be a low-resolution laser print) of a photograph of James. I'm hoping to get a better scan of the photograph in due course, but for the moment will have to make do with this one. Although the caption provided by Mary for the photo stated that, "James Miller & Mary née Cuckson," I believe that the photograph may have been taken in the mid- to late 1880s, in which case this must be his second wife Elizabeth. The newspaper cutting transcript made for a very interesting read. Death of a remarkable character. Sept. 19th, 1893. We have received the following from an esteemed correspondent:- A well known figure has been laid at rest in Mugginton Churchyard, James Miller, age 77. His death took place at the residence of his son, at Heatley, Abbots Bromley. At the grave was sung “Now the labourer’s task is o’er.” A labourer he had all his life been, at work in a brickyard at five (he would boast), farm servant at ten. Never at school, save to an old woman, yet he would say he would beat all the village lads in scholarship. Industry and energy were rewarded in his case. We find him occupying a farm on the Combermere Estates in Cheshire, employing labour far beyond the requirements of his farm in his speciality of draining. This took him from place to place, and his heavy commitments in farming improvements, such as the application of steam in days when science was not so well understood seems to have crippled him, however. He left the “Noon Sun Farm” for draining operations. The drainage of Kedlestone Park was his first operation in this neighbourhood. His life now experienced a change for the worse. His business calculations after a night spent with friends, required an occasional spoonful of brandy, till his wife would say, after calls for more spoonfulls than she possessed patience, “getting sober is worse than getting drunk,” and would place the bottle before him. This one old friend indignantly refused. Nevertheless he would put in his occasional plea for a spoonful still. However, it was soon plain enough that the beer and the brandy must go, or else there would be no business falling in. It was some 33 years ago that he was induced to attend a temperance meeting at Derby. He said little to his companions on the way home, but, characteristic of his energy and determination, on reaching home he broke in the head of the beer barrel, and seeing the week’s marketings just brought home – on the table – pounced on the weekly parcel of ‘baccy and burnt it, remarking upon beer and ‘baccy – when expostulated with as “being what might have done some poor creatures good” – “What’s bad for me can’t be good for others.” His wife was wholly sceptical as to any change of a permanent nature – she was mercifully wrong in this forecast – and, with the dismissal of alcoholic drinks, his better fortune revived. He started somewhat substantial brick and tile making works at Weston Underwood, built a reservoir, introduced all recent appliances, and with stout sons and labourers to push the drainage works, was soon in possession of a large connection and comfortable income. His energy in the temperance cause was great; on the first row of seats his square shoulders might be observed. From his youth he had suffered from deafness, probably the result of a blow from a master when in service – when, then, the speaking commenced, his ear trumpet was an unfailing landmark. His liberality to this, and many good causes, was profuse; in fact, he only seemed to prosper for the prosperity of objects brought under his notice of a deserving character. He was self-taught as a self-made man, and, knowing the value of education, he gave his leisure hours to the education of others. He taught for years in a night school, in days when lads had never heard of “standards” and “labour certificates.” He was a great composer of prose, the spelling and grammar of which was controlled by rules of his own. The sense, however, was there. This leads to a digression. Being a great politician and reader of Parliamentary debates, he would delight his audience (on reading of “a scene in the House”) by remarking – “Another SENSE in the House of Commons!” and no one could ever persuade him as to the correct pronunciation of that word. His last great work was that of the formation of a chain of lakes on Mr. Ratcliffe’s estates, near Diseworth, but in this neighbourhood his name is most familiar. In later years he had the satisfaction to see the closing of many public-houses, the steady increase of members of abstinence convictions, the growth of the Bond of Hope, under the peculiar care of his eldest son, Mr. John Miller of Weston-Underwood, who, without having the impetuosity of his sire, has convictions upon the great questions of temperance. The subject of this memoir was a sterling Christian. Whoever might be absent, he ... sure (whom he long lost at Manchester), were ever in our places at church. When wholly too deaf to hear he came for example’s sake, and read an M.S. sermon placed in his hands by the Rector as he ascended the pulpit. Of late, almost entire blindness supervened; but his patience and tranquility astonished all. His Weston Underwood business had been finally closed, and he lived, until his second wife’s death, among relations, after which he settled down with his Staffordshire son. The tone of himself and family (all of whom are strictly teetotal) was admirable, and he has passed away in a good old age, leaving an example for those who knew him. In previous articles I posted several photographs, old and more recent, of buildings in Weston Underwood, including the scan of a commercially produced postcard from the early 1900s shown above (Courtesy of Andrew Knighton). The north-easterly view shows the main cross roads in Weston Underwood, with the chapel or "reading room" built by James Miller in the centre middle ground. Apart from five boys and a girl, an elderly white-bearded man is shown leaning against the wall on the left, and I speculated that this may have been my gg-grandfather John Miller. In a phone conversation with my aunt, she told me that a few years ago she found a framed photograph in a Derby antique shop of a Weston Underwood scene, apparently enlarged from another old postcard, and that it had since been hanging in her spare room. Although it was too large to scan, I'm very grateful to Nigel Aspdin for photographing it for me. It clearly shows the large Miller house to the north-west of the cross-roads (to the left of the previous view) with seven young girls standing on the pavement and in the road, and the chapel partly visible in the right background, through the trees. Also in the shot is a tent, apparently of pseudo-medieval style and perhaps used as a children's playhouse, erected in the garden. It is possible that two or three of the children in these photos are grandchildren of John Miller; his son Wilfred Miller had married in 1904, had two sons and a daughter by 1909, and was still living in the village at around this time. The current owners of the property where the chapel was, Ivor and Eve Abbott, purchased it around 1965. They took these three excellent photographs of the chapel and surroundings in 1965, before and during the demolition of the building. I'm very grateful to Ivor and Eve for permission to use the slides, to John English for scanning them with a great deal of skill, and to Nigel Aspdin for arranging it all. However, the most exciting discoveries - at least for me - were two surviving bricks from the old chapel, bearing James Miller's stamp, which were discovered by Ivor and Eve in a corner of their property. Nigel duly collected them from Weston Underwood and photographed them for me. Nigel also paid a visit to the Derby Museum of Industry and History, housed in the old Silk Mill off Full Street, where there is a section of clay industries, including brickmaking. They have on display a brickmaking machine, shown above, which may have been very much like the ones used by James Miller at Weston Underwood. The upper plate of the mould shows very similar screw heads to the impressions left in the "J. MILLER"-stamped ones photographed by Nigel. One of the two bricks is already in the safe-keeping of my aunt, and Nigel intends to deposit the other with the Industrial Museum, to go with their established collection, shown below. There are many people who have been directly or indirectly involved in bringing together the various aspects of this story. I am very grateful to my late father Bud Payne, aunt Barbara Ellison, cousins Lynne Tedder, Gwen Miller and Mary Hirst, as well as Andrew Knighton, Ivor & Eve Abbott, John English and, last but not least, my friend Nigel Aspdin. Without them researching this story would have been far more difficult, perhaps impossible. It certainly would have taken a great deal longer.